A lovely nose of earthy pinot fruit. Slightly perfumed with hints of oak, soft spice, liquorice and Bovril. Dry, low acidity, low-medium tannins. 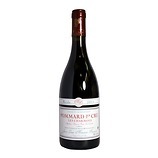 Full, rich and earthy redcurrant/ berry, oak, sweet spice and a light citric note on the middle. Superb depth but a little masked on the finish at this moment in time with dusty tannins and liquorice.